Compare affordable Supplemental Health Insurance quotes and get coverage today! Enter your ZIP code and click 'FIND DEALS'! What Does Supplemental Health Insurance Cover? Supplemental health insurance is purchased in addition to your health insurance policy to help pay for any medical expenses your health insurance won’t cover. It is often purchased alongside high deductible health insurance plans, or any plan that comes with high out-of-pocket costs. If planned out correctly, you can end up saving big on your health insurance and medical costs each year by pairing your regular health insurance policy with a supplemental policy. Dental and vision coverage: It’s common for health insurance policies to leave out dental and vision coverage. It’s also common It’s also common for health insurance companies to offer dental and vision coverage at a discounted price for their members. Medigap or Medicare supplemental insurance: Original Medical only covers about 80% of your medical costs, so it’s extremely common, and also recommended you purchase Medigap or Medicare Supplemental plans to help cover the remaining 20% of your medical costs. Disability insurance: If you were to ever get injured or sick, and lost your ability to work and make a living, disability insurance has you covered. Disability plans are a very popular supplement people add to their existing policies. Travel health insurance: Most US health insurance plans have little to no coverage when you travel abroad. If you and your family are planning any vacations overseas, these plans will reimburse you for any medical costs you incur while on your trip. Supplemental insurance for deductibles: People often choose the health insurance plan with the lowest monthly premium. The kicker is that those plans usually come with the highest deductible or out-of-pocket costs. Supplemental plans for you deductible are a great way to keep yourself protected in case of a medical emergency. 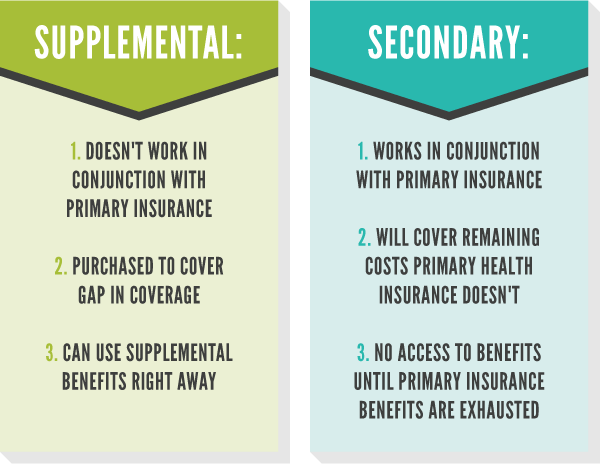 The different types of supplemental insurance may offer different payout structures, but each plan will work similarly to how your regular health insurance plan works. You make payments, known as premiums, each month. With those payments, you will remain covered for the services you are getting supplemental insurance for. This way, next time you go to receive medical treatment, your supplemental insurance will kick in, and help pay, or fully pay for your medical expenses. 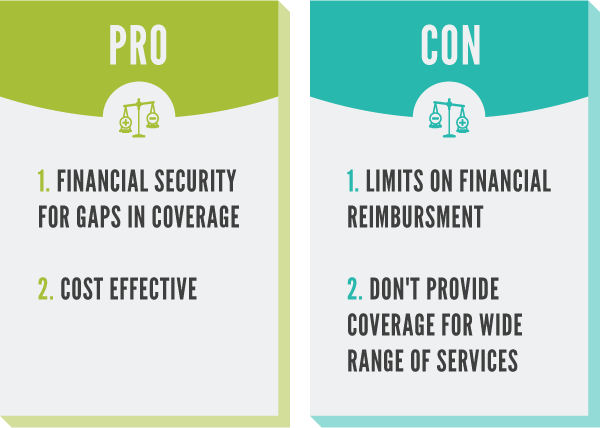 The coverage amount depends on the plan you choose. For example, if you have supplemental coverage for dental and vision, it may come with a small deductible or copay for checkups. This would work exactly like your primary policy. Other supplemental plans may only pay a lump sum in the event of a qualifying emergency. For example, if you buy a disability supplemental plan, you may only receive a one-time payout rather than your policy paying for your medical bills. Supplemental health insurance plans cover a range of medical services. Each plan will specify what they cover, but typically supplemental plans are purchased for specific services. For example, if you purchase a dental plan, you will only be covered for all your dental services. This could be preventive checkups along with more expensive root canals. The same goes for vision supplemental plans. Whatever you purchase coverage for, you will have coverage. Your supplemental health insurance plan won’t cover anything that falls outside what the policy specifies. For example, if you buy a high deductible supplemental plan, you will only receive money towards your deductible payments. Anything that falls outside your deductibles, like prescription costs or disability, will not be covered. Your plan will have a clear outline of what is and what is not covered, so make sure to review your policy carefully. Anyone who has gaps in coverage or high deductible plans should consider supplemental health insurance plans. Supplemental plans are usually more affordable than you think and can end up saving you money on medical services your primary health insurance won’t cover. Do You Need Supplemental Coverage If You Have Medicaid? Depending on where you live, you may need to purchase a supplemental health insurance plan to go along with your Medicaid. Medicaid does offer comprehensive health coverage as required under the Affordable Care Act, but may not offer coverage for anything that is not part of the minimum essential benefits. On the federal level, dental coverage is considered optional under Medicaid, which means not every state has to offer dental coverage with Medicaid. If your state doesn’t offer dental coverage under Medicaid then this would be an instance when you would want to purchase a supplemental dental plan. Do You Need Supplemental Insurance For Medicare? You are not required to purchase supplemental insurance with your Medicare, but it is highly recommended. The only exception to this is if you are eligible and enrolled in both Medicare and Medicaid together. You pay for Medicare your entire life in taxes and are only eligible for the government-administered health program when you turn 65 years old, with a few exceptions. Original Medicare will provide you with sufficient coverage, but there will be about 20% of all medical costs not covered. That is why Medigap, or also known as Medicare Supplemental plans, are so popular. Learn more about Medigap plans here, and even look for and compare Medicare Supplement quotes in your area. While supplemental plans seem like a good idea on the surface, they may not be a good fit for everyone. It’s important to weigh both the pros and cons of supplemental insurance before making any purchases. Provides financial security for your gaps in coverage. Supplemental health insurance is cost-effective and can allow you to reduce costs on your primary insurance monthly premiums. Supplemental insurance plans may have limited the money you receive towards your medical costs. Supplemental plans don’t provide coverage for a wide range of medical services. The two are very similar, but there is a slight difference between supplemental health insurance and secondary insurance. Secondary Health Insurance: Secondary plans are coupled with primary health insurance plans. Typically, secondary plans are purchased when both spouses work jobs with health benefits, and they want to take advantage of each. The secondary plan will help cover any remaining costs your primary policy won’t cover. Supplemental Health Insurance: Supplemental insurance is slightly different than secondary plans because they don’t work in conjunction with your primary policy, or your secondary policy for that matter. Supplemental insurance is bought to cover a gap in coverage, such as dental, that your primary or secondary plan won’t cover. Can You Have 2 Health Insurance Plans At The Same Time? Yes, you can have 2 or more health insurance policies at the same time. In fact, it’s not uncommon for policyholders to couple their primary insurance with secondary insurance, and even tack on a supplemental plan for the remaining gaps in coverage. If you have more than one health insurance plan, your primary policy will need to be used first, and your secondary policy kick in once your primary policy benefits are maxed out. Since supplemental coverage is purchased for coverage that neither of your primary or secondary policy will cover, you can tap into its benefits right away. Enrolling in multiple health insurance plans seems like an expensive undertaking, however many major health insurance companies will offer discounted rates when you purchase supplemental or secondary coverage. Having multiple health insurance plans can also save you money if you have an extensive medical history or suffer from medical emergencies. Whichever plan you are the primary on will be your primary health insurance provider. For example, if you and your partner are both enrolled under each other’s employer-sponsored plan, you will be the primary policyholder on your plan, and your partner will be the primary policyholder on their employer-sponsored health plan. Your supplemental insurance will vary in price depending on the type of coverage you are looking for. If you are looking for exact rates, you are going to want to talk to a licensed agent or broker. However, here some of the average prices you can expect to pay for supplemental health insurance. Are Supplemental Health Insurance Plans Tax Deductible? Yes and no, it depends on the supplemental plan you are enrolled in. For example, supplemental health insurance plans that pay out a predetermined amount in the event you get sick or injured cannot be deducted from your taxes. However, if you are enrolled in a Medigap or Medicare Supplemental plan, you may be eligible for tax deductions. Make sure to talk to your financial advisor or health insurance agent or broker to learn more. You can take a headache out of searching for supplemental health insurance quotes by using free comparison tools and services. First Quote Health, for example, offers free supplemental health insurance quotes in your area. You can compare, shop, and even talk to a licensed agent or broker within minutes. All you have to do to get started is enter your zip code and you can find coverage today. Can you purchase supplemental insurance through the marketplace? Generally, supplemental health coverage is not sold through the marketplace. You will usually have to enroll in a supplemental plan with an agent, broker, or health insurance provider. What are the most common supplemental health insurance plans? The most common types of supplemental health insurance plans are Vision, Dental, Medigap, Disability, and Gap coverage. Is there usually a waiting period for supplemental coverage? With Medigap or Medicare Supplemental plans there can be a waiting period, but most other supplemental health insurance plans don’t require a waiting period. Do supplemental health insurance plans come with a deductible? It will depend on the plan you purchase. For example, your dental and vision plans may require you to pay a deductible, while supplemental insurance for high deductible health coverage won’t.